For most people, the first step in creating a monthly budget begins with a pencil and paper, jotting down how much has been spent on groceries, utilities, bill payments, and so on. After a while, things get messy and a spreadsheet offers a more structured alternative. But wouldn’t it be better to automatically synchronize all your transactions in one budgeting tool and save yourself the hassle of manually transcribing each transaction? CountAbout is a cloud-based budgeting tool designed to help you budget smarter from anywhere. All your bank account transactions are kept in one place so you don’t have to manually keep track of your income and spending. And if you are looking for a cloud-based alternative to Quicken, CountAbout is worth checking out because it automatically ports over transaction categories, so you don’t have to worry about losing your past financial history. Plus, if you are a Mint.com user, CountAbout syncs with it too – in fact, it is one of the few budgeting tools that connects seamlessly to both Quicken and Mint. If you struggle to keep track of where your money goes each month, a budgeting tool like CountAbout can help you to quickly spot areas to save and budget better. By automatically connecting to your bank accounts, CountAbout helps you to avoid the time and hassle of manually keeping track of each cup of Joe you purchase – which can be tedious and error-prone. If you are a spreadsheet ninja you should also find CountAbout a lot more friendly to use because it’s as easy to get a pulse on your finances at your desktop as it is on your mobile device when you are on-the-go. Quicken and Mint users will find CountAbout to be a viable budgeting app alternative, and you don’t have to put up with those pesky ads you see on Mint. If you are worried that your history of transactions will be lost, don’t be. CountAbout lets you import transaction categories so you pick up from where you left off as opposed to starting from the ground up. The bottom line is whether you are synchronizing data from bank, credit card, or retirement accounts, CountAbout provides a clutter-free interface to help you better track your personal finances. 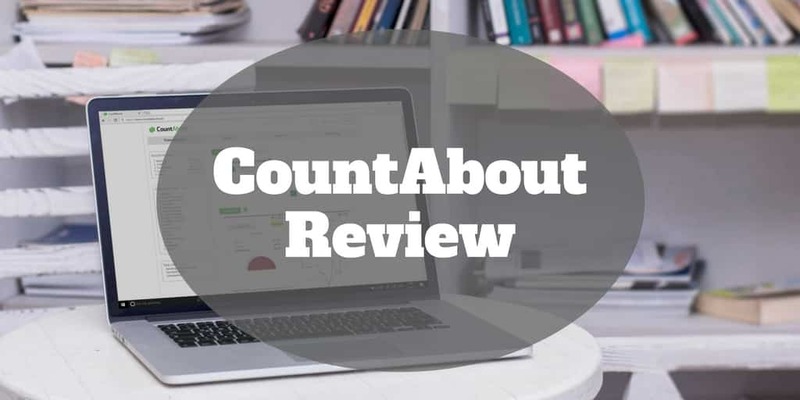 Bank level security, access on-the-go from anywhere, seamless integration with Quicken and Mint, and visually intuitive graphs and pie charts are among the many features you get at CountAbout. Perhaps the most important thing to consider when choosing a budgeting tool is your personal information security. High profile data breaches hit the news headlines so regularly these days that it should bring some comfort that no usernames, passwords, account numbers, phone numbers, or addresses associated with your financial institutions are stored. CountAbout doesn’t connect directly to your financial institution but instead uses MX®, a widely respected third-party service that partners with thousands of financial institutions. If your institution isn’t listed, CountAbout can request MX to add institutions. Plus, MX as an aggregator of aggregators maintains multiple connections to banks so if a connection goes down they can switch over to a new connection. Currently, MX maintains over 30,000 connections. When you sign into your account, you will see that CountAbout relies on multi-factor login protection which is bank-level security designed to keep your information safe also. As a cloud-based budgeting tool, CountAbout connects with both iOS and Android devices, so whether you use a Google Pixel, Apple iPhone or Samsung Galaxy device, you can keep track of your finances from anywhere. A standout feature of the CountAbout software is how seamlessly it integrates with Quicken and Mint. If you have been looking for an alternative budgeting tool, you can simply import a QIF file and all your transaction data and categorizations will be moved over to CountAbout without you needing to re-enter data or worry about losing your past history of transactions. CountAbout features Widgets that display line graphs and pie charts with income and spending patterns so you can quickly spot spikes in expenditures and areas where you may be overspending relative to your overall income. Most budgeting apps help you to track regular day-to-day spending, whether on groceries, utilities, mortgage or rent payments, and so on but few will display investment accounts. CountAbout stands apart from many other budgeting tools by helping you to track your investment retirement accounts also. CountAbout is a low-cost budgeting app that lets you view your bank, credit, and retirement accounts securely in one place without interruption from ads. However, you cannot move money between bank accounts or pay bills online through the app. ✅ Low Cost Budgeting App: The monthly and annual prices for CountAbout are about as low as any paid budgeting tool on the market. ❌ Paid Plan: Other personal finance apps, such as Personal Capital, offer free budgeting tools but generally try to up-sell you to invest or serve you with ads. ✅ Connect Your Accounts In One Place: Whether it is your bank, credit card, or investment accounts, you can view them all in one place to keep better track of your financial circumstances. ❌ No Bill Pay Options: You don’t have the ability to pay bills through the CountAbout app as you can with some other budgeting tools. ✅ Ad-Free: Unlike Mint and other tools that interrupt you with ads, CountAbout never displays ads nor does it sell your personal data. ✅ Mobile App: Both Apple iPhone and Android users can access CountAbout’s cloud-based software from anywhere that has an internet connection. ✅ Seamless Integration: Few budgeting tools support both Mint and Quicken integration, but CountAbout will allow you to do so without losing any past transaction history or category labels. ✅ Security: Two-factor login authentication protocol and bank level security via third-party provider, MX®, are used to keep your personal information safe. ✅ Top Notch Reporting: Reports are easily generated, intuitive, and comprehensive. ✅ Flexible Data Editing: Making edits to your categories, transactions, and labels is easy to do so you have a lot of flexibility to keep track of data as you prefer. CountAbout is a low-cost budgeting app that syncs all your accounts in one place to help you better keep track of your income, spending, and retirement accounts. If you find yourself overpaying from one month to the next on food or entertainment, or simply come up short of cash when it is time to pay your bills or buy presents for loved ones, CountAbout can help you to visualize where you money is going, categorize your transactions, and budget better. For Quicken and Mint users, CountAbout provides an alternative by seamlessly integrating with both so you avoid the worry of losing any transaction history. Plus, you can access your personal finances wherever you are with CountAbout because of its cloud-based solution that is compatible with iOS and Android devices. One drawback at CountAbout is its lack of bill-pay options. But for an app that takes security seriously, doesn’t serve you annoying ads, and provides comprehensive reporting, CountAbout is well worth your consideration. ‹ PocketSmith Review 2019 – Predict Your Financial Future!